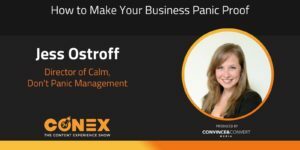 Jess Ostroff, Director of Calm at Don’t Panic Management, joins the Content Experience Show to discuss finding your specialization and her new book, Panic Proof. In the world of startups and entrepreneurs, there’s a lot of praise thrown at people who can get everything done themselves. There’s an almost religious admiration of people who bootstrapped their company by working an unimaginable amount of hours handling everything from marketing and PR to product development. While it may seem like a superpower, what if this approach was not only inefficient but possibly detrimental? 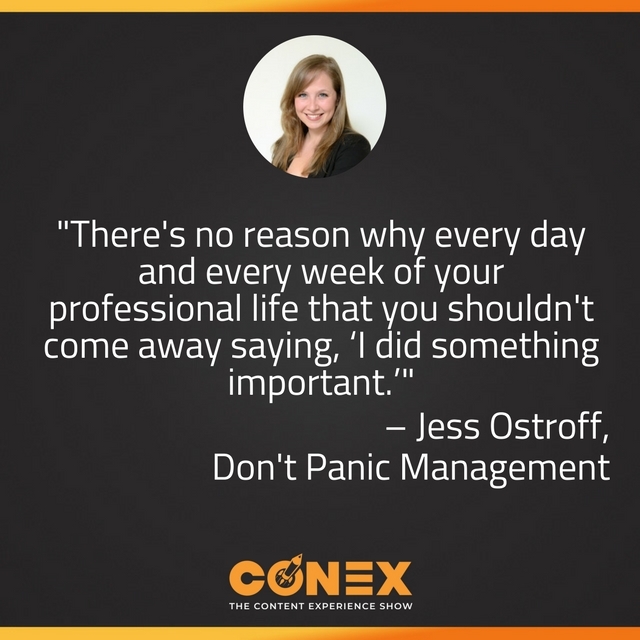 Jess Ostroff of Don’t Panic Management certainly believes that there’s a better way, as she makes clear in her new book Panic Proof. Rather than trying to take on as many tasks as possible, zero in on the things that you specialize in and enjoy the most and either automate or delegate the rest. By reaching out to your team and prioritizing their time and tasks, in the same way, you can maximize efficiency and ultimately build a happier, healthier, and more successful business. If you could just leave people with your top trick to being your best self what would it be? Jess’s answer is simple and to the point: Don’t Panic! Jess is going to give us two really interesting true facts about her and amid those will be a lie. Spoiler alert: Jess is, in fact, an amateur trapeze artist and has achieved the highly improbable double black eye! 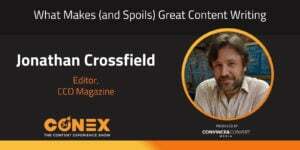 Randy Frisch: Welcome to the Content Experience show. I'm Randy Frisch, I've got Anna Hrach Joining me and I'm really excited about the guests that we had this past week Anna. It was a ton of fun down have our producer talk to us about how we can be more efficient as a marketing team, as a leader, as a manager, as a team member. I know both of us learned a ton this podcast. Anna Hrach: Oh, totally. It's amazing. Sometimes we get so caught as content creators, content marketers, content strategist. We're so focused on the output, we don't actually take time to turn around and think about us and how we're contributing to the content experience and how we're not being our best selves so we can't be the best for everybody else. Randy Frisch: Yeah, it's really interesting. Some of the stuff we'll hit on in this podcast is things like do we still want full stack marketers on our team and we've really kind of changed at Uberflip in terms of how we think about that. Now, don't get me wrong, we love that hacky growth marketer mentality and we love people who can get their hands all over the place but we're also as we've grown and our marketing team's around 15 people, we've kind of gone back to this idea of specializing. I'm not going to say that that's what Jess is hitting on but at the same time I think her idea is we've got to focus more as marketers. Anna Hrach: Yeah, absolutely. And Jess has a ton of experience with this. For those of you who haven't been formally introduced to Jess Ostroff, she is CEO and director of comm at Don't Panic Management, a group of proactive neighborly assistance who turn chaos into contentment, frustration into focus and panic into productivity with virtual assistant and content marketing services. And she also just released her first book "Panic Proof: How the Right Virtual Assistant Can Save Your Sanity and Grow Your Business" and she is also the producer of our podcast. Randy Frisch: Amazing that with all of those things that she undertakes that she's able to talk to us about focus, right? Anna Hrach: Right. It's funny too because you'll even hear her talk about multitasking is bad and I don't know how she gets it all done in the day but she does. Randy Frisch: I think one of the big takeaways that everyone listening in will enjoy is the matrix model that she uses to describe prioritization and how as marketers too often we're caught in the weed. We're focused on just coming in and getting everything done that we have to do every day and it's funny, I used to do this for myself in a very hacky way. I would write three big things I wanted to accomplish each day. Someone told me that there's something really great about crossing those out. At the end of the day you cross out those big three things that you accomplished that are different than your regular routine. They only sound like three but if you can do three a day, now, just think about that, that's 15 a week over a 10 week period, just two and a half months, that's 150 items that you would have conquered. And I think those are some of the mentalities that we have to try and achieve and we've learned a lot from Jess in this podcast about how to [tackle 00:03:10] that. Without further ado why don't we loop Jess's interview right in here. Stay tune, buckle up, enjoy the next 25-30 with Jess Ostroff. Anna Hrach: Jess, thank you so much for being here today. I am so excited to talk with you and Randy just about all the great stuff you have going on, all of your experience and I think people are really going to appreciate on this episode sort of the different perspective that you bring. Jess Ostroff: I'm so happy to be here. It's fun to come out from behind the virtual curtain if you will and be here with you guys. Anna Hrach: It's crazy because you've been a producer for so long and so people whether they know it or not have been with you every week. Jess Ostroff: Right, right. And I have jumped in, last year at Conex actually I did a series of interviews for Randy and Tyler because they were so busy being on stage. So, I've been a little bit in the scene but mostly behind the scene. Randy Frisch: For those listening right now, it was actually funny, we'll share what just happened which is you're always producing this and now we've asked you to jump into the guest position and we were all just sitting here being like, okay, who's going to hit record on the actual podcast or like, Jess, you got to multitask this today which maybe is the best transition I've ever done to the actual topic, which is how do you multitask, how do you handle everything that's put on your plate. Jess Ostroff: I was thinking about that too. I was like this is so efficient. And actually that's what I would call it. I actually try not to multitask because it's really bad for your brain and my mom does a lot of research on this, the brain in general, she teaches like a pre-k through third grade leadership and curriculum development program and they always talk about how bad it is for your brain to multitask. So, I try to do less of that. But what I do focus on is being as efficient as possible with what you have, the time that you have and the resources that you have and the technology that you have, and so that's one of the things that I focus on with business owners, marketers, anybody that could possibly be busy and in need of help. Anna Hrach: You know, it's really interesting that you bring up sort of your area of expertise, Jess, because I think one of the things that I'm most excited about to have you on is the fact that, you know, Randy and I talked about the Content Experience Show being a little bit broader in some ways and talking about all aspects of content and part of the content experience is really being your best self and that's actually really what you help people do, right? Jess Ostroff: Yeah. My goal, and I didn't necessarily know this when I started doing all this kind of work but my goal now and sort of my purpose in my work is to help people live their best life, whatever that means. If you're a workaholic and you love your job and you want to work 24/7, that's fine, that's what you should do. If you have a family or you have a dog or you have some other hobby and you want to be able to spend time doing that and really be able to give your focus to that as well then that's great. What I've noticed over the years from a lot of people is that we're doing a lot of unintentional work. And that's what I want to try to avoid. Processes for the sake of process, meetings for the sake of meetings. There's no reason for that anymore especially given all the technology that's available to us and all of the resources for learning and doing things in a more efficient way, there's no reason why every day and every week of your professional life that you shouldn't come away saying I did something important today or I worked on something that's really great this week or I made a difference in someone's life this week. And so, that's sort of my mission and my goal in what I'm doing today. 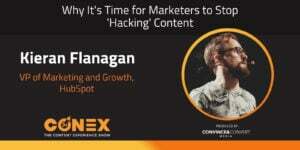 Anna Hrach: I love that messaging so much and especially as content marketers and content creators and content strategists are being asked to do more and more and more and our time is being divided and positions are being merged, it's so important like you said to just be your best self and live your best life every day. Jess Ostroff: Yeah. Everything I read, every new research report that comes out about content creation and content planning and strategy and things like that, it seems like we're actually, we're required to do more like you said, whether it's more words or more graphics, more videos, more output overall but we're not being given more resources. So, that's a challenge. We have to figure out how to do more with the same. But that is possible, I think it is truly possible if we just focus on how we're managing our time and what exactly we're doing. I believe that everybody has their core skill set and a lot of times especially when we're young and we're growing into roles, we sort of become like Jack and Jills of all trade especially in digital marketing because we're always learning things. I think about this this podcast and the Convince and Convert Podcast network, when Jay decided that he wanted to start Social Pros, he basically said, hey Jess, can you like figure this out. I had never set up a podcast before, I had never produced a podcast before and at that time, this was like five years ago, maybe more, there wasn't a lot of documentation like there is now. There wasn't like a how to create a podcast course. So I just had to google stuff and figure it out. I think that's happened to a lot of us. As each platform grows and evolves we have to expand our skill sets. At the end of the day, I don't think that all of those things are necessarily what we're best at. I think that we need to get back to basics and figure out what we are uniquely qualified to do, what we love to do and then get rid of everything else through automation or delegation or just working with your team and figuring out, hey, none of us are actually really good at this one thing, maybe we have a gap here and maybe we need to figure out how to find that solution and that's okay. Randy Frisch: I love that Jess, I love that mentality of focusing on what you're good at and putting all of your attention to one thing at once. I actually often kid with my wife because to your earlier point, none of us can multitask but I'm really bad at it. So what I always tell her is I'm like listen, what you do know because I don't try to multitask is if I'm listening to you I'm fully listening to you because there's no way I could be doing something. Whereas don't even try otherwise. I think as marketers that mentality can allow us to be so much more productive. I'd shared with both of you a post on LinkedIn and it was actually from one of their regional Conex back when we were at the Content Pros Podcast co-host Amber Naslund and she wrote on LinkedIn and I'll just take a little bit of an excerpt here. She was talking about being interviewed as a marketer and the question she would get is what kind of marketer are you and she says, "I used to think this was a liability when I was younger, the need to say everything. I think, yeah, I need to collect all the skills to be qualified as a CMO," but ultimately she goes on to say that's not the trick. Knowing what you're good at and knowing where and how to build capability around you is what distinguishes you as a leader from a manager. I think that's very aligned to what you're talking about and I think the reason we're so excited to have this podcast today is how do we as marketers show the best parts of us and embrace those around us. Jess Ostroff: I love that. I love Amber and I love that message. It's just too easy to get caught up in the shiny and unfortunately I've noticed this and you guys probably have too, a lot of today's marketers don't actually have a marketing background. They have like a technology background or they're a millennial like me who grew up with Facebook. And so they got into sort of a community management role because they were outgoing and they knew how to use the tool and then from that maybe they've learned, maybe they've learned how to do marketing and how to really attract the right audience as in be able to sell to them. I think we got a little excited when all of these new tools and technologies came out and everybody was doing everything and now, it was sort of a bubble that burst, and now we're finding that we do need to go back to basics and hone in on the things that we're best at because we have to do more of them. Jess Ostroff: Yeah, yeah, we saw him at Conex last year too. He does this blogger study and he interviews, or I should say surveys, at least a thousand bloggers every year, a lot of times it's more than a thousand. And they talk about their different things that they do. And every year it seems like the amount of time that they spend on writing goes up. The truth is that not all marketers are great writers but like maybe they're great at crafting the message or maybe they're great at promoting that piece of content or maybe they're great on video and they can go live and talk about whatever it is that that blog post is about. But if you're spending six, seven, eight hours on a blog post, you have to be a good writer. And so, maybe we should just have writers. Randy Frisch: So let me ask you this, let me jump in there. There was this time and maybe it's like four years ago, maybe I'm very stuck in 2013 right now. Where the buzzword in terms of the type of marketers we were looking to hire was the full stack marketer. We wanted the person who could do it all. They could optimize for SEO while writing an amazing post and designing a beautiful infographic all in the same afternoon. If you were building a team of marketers and some of the best marketers you talk to you and you talk to a lot of them through Convince and Convert and your involvement there, do you still subscribe to that idea of a full stack marketer? Jess Ostroff: I love the idea that someone has a cursory understanding of all of that and I have to say when I interned with Jay when I was 20 or 21, part of my internship was actually going and sitting with the manager from each department. So I sat with the PPC guy, I sat with the copywriting gal, I sat with the analytics person and I just like sort of shadowed them for a day. And that was good for two reasons. One, I was still trying to figure out what the hell I was doing with my life. But two, it helped me have a basic understanding of the whole wheel. I wasn't just in my little spoke, I was understanding what was going on around me so that when I did get more focus on sort of the writing and the copywriting part of things I understood why that was important. So I think that that part of it is definitely valuable but I don't think that the full stack marketer, I don't think that's necessarily the best way to service your team. I think you're better off ... If you have the budget, again, it all comes down to budget and resources but if you can have a really good writer, a really good analytics person, someone who really understands search, someone who understands paid, you're better off having specialists in that category and then perhaps your manager or your CMO, that person has a bigger understanding of the strategy of all of those things so that they can manage each person. I think that you're going to get better results, you know, content and all of marketing today, it's not just about putting things out there anymore. You have to put out really, really great stuff and I don't think you can put out great stuff when you have someone who only sort of touches the surface of everything. Anna Hrach: It's times like these when we do these podcasts and somebody like you drops some amazing tips and knowledge like that that I wish people could see me on video literally just praising everything that you're saying because it's true and Randy and I actually had a conversation about that recently as well about just how important it is to get people who are so good at what they do and help them understand that. I want to talk more about this but first we should take a quick break to get a quick word from our sponsors but when we come back we're going to talk a little bit about how you hope your team at Don't Panic Management plus how you can help everybody else with the release of your new book. Hey everybody, welcome back. We are here talking with Jess Ostroff who is the CEO and director of comm at Don't Panic Management. Now Jess, right before the break we were talking about finding those T shaped people, really not having to lock ourselves into being those full stack marketers like we talked about and how that's actually kind of a disservice. How did you take all that amazing knowledge, finding what you're good at, really not succumbing to that super hero syndrome and help impart that onto your team at Don't Panic Management? Jess Ostroff: Well, first of all I had to take my own advice. Anna Hrach: Which is never easy. Jess Ostroff: Right right. My whole kind of adult career has been about telling people to ask for help, it's okay, get out of your own way, we can do these things for you and then of course I'm sitting here being like I need to work 16 hours a day and I have to do everything, send invoices and talk to every single client and yada yada. So it was useful for me to sort of hit a wall and realize that I couldn't do all of that. And now I think it actually is useful to go through this yourself because then you have the first hand experience of how to talk to other people about it. The way that I've been able to I think do this with my team is to really nurture what I see. So, someone might come into an interview or send me a resume and say I'm really going to copywriting and I'm really good at social media and I'm really going to admin and all this stuff. And when I interview them I try to drill down more into why they think they're good at those things and what their experience has been. And it's true especially I think when you're younger or when you're in this sort of virtual assistant or marketing coordinator type space that you do do a lot of these different things. When I ask questions like, tell me about a time that you really feel like you knocked it out of the park at work. I can hear what that project was and why they think they did so well and how it made them feel. And that starts to give me an insight into what really makes them tick. Whether they know it or not, that question sort of tells a lot and then on the flipside I always ask tell me about a time when you made a mistake or something didn't go your way and then I can kind of see what challenges they have either with managing their time or reporting to a boss or maybe there are certain types of work that they think they're good at that they're not good at. And then I also always give them a test project and if they are interested in multiple different disciplines I will give them multiple test projects. And then I can judge how good at something they really are with rubrics that I've set up. And so, of course if I think that they're really great writer and they hate writing, like I'm not going to force them to do that but usually I found that the things that somebody is best at is also the thing that they enjoy the most. And so, through the interview process and through giving these test projects I think I've been able to sort of assign people in the place where they are and then nurture that skill for them. So, give them feedback on their work constantly. Invite them into trainings that we're doing. We do these like luncheon learns every month or so. We also have a Don't Panic book club where we read different kinds of business books. We allow them to let us know, like if they have always wanted to learn how to produce podcasts, I can give them a training and a guide to do that and of course like I'm not going to just let them do that if they are not good at it but there is always the opportunity to learn but I think all of those things help nurture the skill that they are great at and help grow that skill. I do think that there's a difference between virtual assistant type person where they're doing multiple different things like different hours for different clients and things like that and an employee at a company. So, if you're an employee I don't necessarily think that you can be a writer solely for 40 hours a week. I keep going back to this example because I think good writers are so important but I also don't think that it's possible to just write, write, write, write, write all the time, you're totally going to get burned out. So sometimes there are complementary skills that go with what that core skill set is and I think that's okay. As long as at least half if not 75% of your role is spent doing the things that you're best at, then you can do the other 25% maybe reviewing things or maybe meeting about the strategy and whether or not your content actually landed. Talking about your audiences, all of that stuff is so important for everybody on your team to understand. So I think that there's a way to integrate sort of some of those like softer skills with the hard skills. Randy Frisch: So everything that you just outline Jess is exactly why and you can ask my team, there's so many times I've said like I needed Jess. I know that Jay, as you said, Jay was able to say to you, just start Social Pros and start a podcast that's going to have tons of downloads, I mean, how many downloads do you guys get? Jess Ostroff: Oh my gosh. Like around sixty to one hundred thousand a month I think we're at. Randy Frisch: That's insane. This podcast is a spinoff of that podcast so there's so much excitement that's come of this and I think what's even exciting for you and I'm going to allow you to give us a plug is you got to actually write a book with all these findings. Hearing you just talk over the last couple of minutes shows that you've got a framework. Maybe you could tell us a little bit about Panic Proof and who it's designed for. Jess Ostroff: Sure, I would love to Randy. I would not have been able to write this book if I didn't again take my own advice and actually do what I said that I think people should do which starts with auditing your time. Last year I was in a place where I had to let somebody go and it was really difficult. I didn't know what I was going to do because this person was doing a lot of the behind the scenes like operations stuff, sending invoices, dealing with the money, all the stuff that I hated doing. This was the stuff that I offloaded first when I decided that I needed help. And so, having to let her go was really tough and I kind of had sort of a come to Jesus moment where I was like I need help, I really need help. I don't know what the future of this business is going to be. I don't even know if I'm good at this anymore. I sort of had that really big self-doubt moment and I hired a business sort of executive coach and we had a strategic retreat with my leadership team and we figured out sort of what should we be focusing on. I've never had a shortage of ideas and I think that's common for a lot of us creative type people but I never really know which ones to focus on on my business, like should I create a course, should I create a podcast, should I create a video series, what should I do. And all of those things were certainly options but one of the exercises we did was called The Fountain of Youth and I loved this exercise. So it's basically you create a chart and you have an X axis and a Y axis and you've got high risk and low risk on one of the axes, it doesn't really matter and then you've got high investment and low investment on the other axis. You basically plot each idea and there's no bad ideas, it's kind of like a brainstorming session. You plot each idea you have for your business or you could do this for your marketing, you can do for anything based on how much risk and how much potential financial reward you're going to get from each idea. And once we had that, I was able to basically choose the thing or things that at that time would be the lowest risk and the highest possible financial reward. And the first one was writing the book. I didn't have to actually invest anything except for my time to write it and I really had nothing to lose because I was going to self-publish it. I was going to just reach out to my friends and colleagues and ask them to read it and hopefully the big financial reward would not be in book sales but it would be in potential new business and it would be in potential speaking gigs and things like and consulting projects. Once I actually saw that on the chart and saw that it is a real thing that I need to do not just for myself because for me I felt like it was selfish at first, like, well, I just want to say that I'm an author. I want to do this for myself. But when [inaudible 00:26:02] from a business perspective it was actually a useful thing to do, then I did it. And I know that Randy especially you are interested in sort of the agile method and we used that. That was just one part of the strategic planning session. We found out a lot of our win initiatives, things that we would work on for the rest of the year among the team and each one of us got to take a sprint and a sprint is a very agile thing. Oftentimes sprints are two weeks. We did one week for each of us to start and then we would add another week if we needed it. It was basically a week off but it wasn't a week off because you're actually working but all you're working on is your win initiatives whatever they are and of course my win initiative was to write the book. Randy Frisch: I love how you just weaved your framework into the actual writing of the book, which is just like such an amazing story to figure out how you realized the importance. You're mentioning agile. It's funny. I was reading an article and I was able to pull it up literally before you said the word agile there because everything you were talking about was showing kind of this idea of setting prioritization. We actually had a guest on the show last year, her name was Andrea Fryrear, she's with Agile Sherpas. She was great. People can can go to listen to that that past episode if they missed it. This was a post that she wrote on marketing [pros 00:27:37] just a week ago and I liked it on LinkedIn and things like that. Or read the first like sentence or two. It says, we content creators have a tough gig. We're not just responsible for the fun kinds of content, the interesting case studies, and in-depth articles on fascinating topics. We also have to deal with, oh, by the way requests all over our organization. Our days become a parade of minor requests. And I think it's exactly what you're talking about, it's how do you take all of those demands that are put on us as a marketer and how do you put a framework around prioritizing. And Andrea goes on to prioritize different ways that we can set up agile but it sounds like your book also had some of these recipes for how we tackle those big projects. Jess Ostroff: Yeah. The book is more about how to find the things again that you truly love or that you're best at and find the time to focus on those. But of course there's going to be things that you hate to do that you have to do. Maybe like if you're the CEO or the CMO and sometimes you have to take meetings that you don't want to take but they're part of your job and that's what you're going to have to do. My goal is to get you 85% of your time spent doing the things that you love to do and yeah, I mean, there are a lot of things in the agile methodology that I love. Besides the Sprint weeks I also love the stand ups and the sort of moving projects through a checklist. I know that a lot of people use Trello for things like. So every morning you've got a big project and you meet together with your team for five or 10 minutes and each person gives their updates and it's basically like what am I working on and what do I need help with. So even the agile methodology in and of itself is totally on the same wavelength as what I always try to help people get to because part of the framework says you have to tell everyone what you need help with. And if there's something that's a barrier to you getting the thing done that you need to get done because at the end of the week or at the end of the project there should be no excuse for why you miss a deadline or why your timeline is off because everyone should know as it's happening whether there's something going on that's going to change the timeline. And I'm not saying you can't change a timeline, that happens. There are always things that are going to go on that get you set off course for whatever reason but when you have these touch points and you have these stand ups everyone's going to know and that way people can jump in and help you or you can push something back or someone who finished their part of the project can say hey, I know an idea that would actually make this happen faster or whatever it is. And so, between having that daily touch point through stand ups and having sprints where you can actually focus on hard work ... Speaking back to multitasking you cannot do hard important work if your brain is not all there. So, you need to figure out a way, whether it's turning off your email notifications or doing what I did where I literally went to a cabin in the woods with no internet to write my book. You know, whatever you need to do. And I think it's important that you not only know that yourself of what it is you need but that your whole team and your manager and whoever it is knows that that's what you need and that you say to them, you're asking me to do this thing, here's what I need to be successful and get them on board with that. Randy Frisch: My team loves it when I end up on an airplane that has no wifi because they know they're getting a good blog post at the end of the day. They're like, uh, you must have been on an airplane today. Anna Hrach: Jess, I love that sort of little tough love nugget you gave there of no excuses and I think you give so many great frameworks in your book. And by the way, it is available at panicproofbook.com. We actually didn't talk about the URL before but in case anybody was wondering where to go get it, panicproofbook.com, Love that there are so many tips and tricks in here. If you could just leave people with your top trick to being your best self what would it be? Jess Ostroff: I wasn't prepared for this, Anna. Well, my rule number one is don't panic and I think that sometimes we get in this mindset that what we're doing is so important. It is, it is important but as I always say to my fellow marketers, nobody's going to live or die. If you don't get a blog post out at 3AM Eastern when it was supposed to go out or you mess up a subject line in an email newsletter or you post a podcast with the wrong title or something, it's going to be okay. I think that if we start to take ourselves a little less seriously, one, I think we will be able to focus on that more important work because we're not so worried about those little details and two, we'll find ourselves a little bit happier. One of the things I talk about in the book is not being a bad client. Because being a bad client makes everybody miserable and nobody wants to be miserable. I think at the end of the day, this is just work, this isn't our whole lives. And I know that's not exactly a business tip per se but I just think that, I love working with you and Randy. I love a lot of the people that I've dealt with at Uberflip and obviously the whole Convince and Convert team is amazing. But I think it's because while we're all really smart and really driven and motivated we don't take ourselves too seriously. We know that we have each other's back and we know that no matter what, it's going to be okay. We're not performing brain surgery. And so, just don't panic. Randy Frisch: I love that. Those are two very strong words to leave us on but if you have time stick around for just another minute and we're going to ask you a couple personal questions to get to know the nonworking Jess to your point. Okay, Jess, so, I know you so well because what people don't know is we always get to have a little chat before we start the podcast or after. So I don't even know what points to kind of hit you on. So I thought we'd do it a little bit different today and Anna and I are going to have to guess here. SO you're going to deliver us. This my kids' favorite game just so you know. It's called two truths and a lie. I'm sure a lot of people have played this before. The idea is that Jess is going to give us two really interesting true facts about her and amid those it could be the first it could be the last could be the second, will be a lie. And we are going to have to decide what is the lie. On you, hit us, Jess. Jess Ostroff: Okay. I used to do this at camp a lot. These are going to be completely random. The first one is that one year I lived in nine different states. The second one is that I once had two black eyes at the same time. And the third one is that I am an amateur trapeze artist. Randy Frisch: Oh wow, I don't know. See, when my kids play this it's like, no, it was 10 states in one year. It's like that was a lie, I don't know now. Anna, do you know Jess well enough to know the answer here. Anna Hrach: You know what, I have a hunch but I feel like it might be not fair because I have worked with Jess for the last year and so I'm wondering if I have like a slight vantage just because I get to talk to her about random stuff. Randy Frisch: It feels hard to get to black eyes. That's the part I'm [inaudible 00:36:04]. I feel like it's one black eye. That's my guess, I feel like it's the black eyes. Anna Hrach: I'm going to go with trapeze artist only because I follow you on social and I've never seen anything about trapeze artistry. Jess Ostroff: Okay. Well, you're both wrong. I only lived in five states so that was like a little sneak attack. Randy Frisch: Okay. Five is [jaustic 00:36:28] enough, that's not like 10. We'll give you that. Okay, cool. Five states in one year. And those were all homes. Randy Frisch: Yeah, I would say as long as you said to yourself I'm going home now, then you lived there. Jess Ostroff: And I had a mailing address. Randy Frisch: There you go. That's a lot of moving. Well Jess, we learned a ton about you today even though we've known you for so long and had you in the background as we said on some of these podcasts. Thanks so much for tuning in and joining us this time on the air. 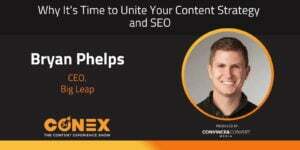 For everyone else who listened in and enjoyed this podcast, you can check us out at contentexperienceshow.com for all the episodes and we always have a little synopsis of each of these podcast for you to share with your team. And if you've enjoyed listening to this, subscribe to us on iTunes, on Stitcher, on Spotify, anywhere you get, even Google Play, anywhere you get your podcast you can find the Conex Content Experience show. Thanks so much for tuning in. Until next time. I'm Randy Frisch from Uberflip. Anna Hrach has been joining us from Convince and Convert. And Jess as always in the background, in the front ground tonight. Take care.